– NASA honored astronaut Neil Armstrong on Tuesday (April 18) as an Ambassador of Exploration at the Cincinnati Museum Center at Union Terminal in Ohio. 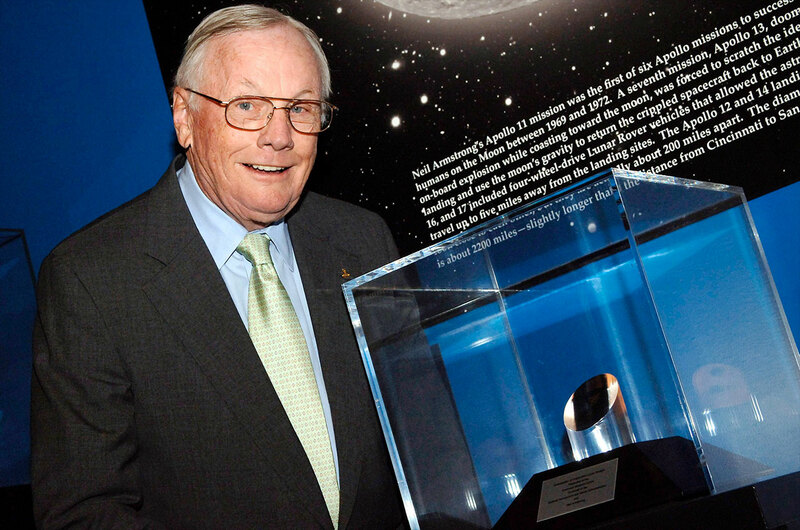 During the ceremony, Armstrong, the first man to walk on the moon, was presented with a small fragment of a moon rock he brought back from the lunar surface, which in turn he donated to the Center's Museum of Natural History and Science to be publicly displayed. NASA Administrator Michael Griffin introduced Armstrong to the audience, which included the astronaut's family. In addition to commanding the first moon landing, Apollo 11 in 1969, Neil Armstrong was honored for flying the X-15 rocketplane and for piloting Gemini 8, "by all accounts the most harrowing space mission that the United States has yet executed and from which survival was possible," said Griffin. "Neil is, if nothing else an engineering test pilot and in that milieu, is a test pilot's test pilot," he said. 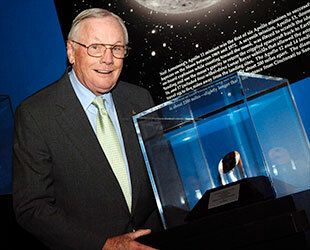 Accepting the award, Armstrong described the moon rock as "impressive," while acknowledging it was on loan from NASA. "I get to keep it myself only so long as I speak, so I am going to be talking longer than I otherwise would," he quipped. As such, he took his time while explaining why he chose a natural science museum to exhibit an award intended to celebrate human achievement. "Many here would know that natural history is the history of things in nature — animal, vegetable or mineral — and excludes humans and their activities. We might conclude that the recounting of human activities is therefore, by the process of elimination, unnatural history," he said. "I'd like to... talk just a bit about a specific, but very thin slice of natural history," Armstrong continued. "Many eons ago, maybe half a star lifetime," he said, as he began to twist the tale that encompassed the formation of the solar system to that of "his" rock. "A piece of the young basalt is completely separated from its mother. His brothers and sisters lie nearby. Let us call him "Bok," suggested Armstrong of the focus of his story. The astronaut recounted the adventure of the small stone, breathing life into geological processes that governed its aging. "Bok changed as he grew into adulthood," Armstrong said. "Crystals of plagioclase that had somehow formed during his solidification added a few plates of molecules. He felt this gnawing in his viscera, like a cancer." "Occasionally, he thought he felt the itch of a change of olivine in his vesicles," he stated. "It was not organic life, but in his universe and by his standards, it was life." Summarizing billions of years in a few minutes, Armstrong told of Bok's journey from the Moon to Earth. "It started with a rude awakening one lunar morning," the astronaut continued. "A peculiar white creature was lifting him with an unusual metal device. He was roughly thrown into a box with some acquaintances he knew only slightly and then the lid was closed and it was dark." "There was a brief force, then a sense of lightness for a time. Then another brief force. Then his weight somehow returned and changed. He felt at least six times heavier than the 190 grams that he had weighed back at the Sea of Tranquility on Luna." "Suddenly, the lid opened, there was light and more of those strange creatures, somehow different and peculiar mechanisms," he said. "There was a strange pressure of an atmosphere. And there was a number beside him — 10071. Clearly, they didn't know his name." Armstrong concluded while referencing the award that was sitting to his left on the stage. "If you want to see Bok and have him clarify any points that may have been obscure, you may do so. He is, or at least part of him is right there. The sample on the award is a chip of 2.039 grams, a chip off the old Bok, you might say," Armstrong remarked. "I hope I've persuaded you that a place of natural history is a great place for Bok to be," he said. Doug McDonald, the museum's president, accepted "Bok" on behalf of the Cincinnati Center, where it'll go on display along with a replica of Armstrong's spacesuit. NASA is presenting Ambassador of Exploration Awards to 38 astronauts and other key individuals who took part in the Mercury, Gemini and Apollo space programs. To date, 15 rocks have been awarded, including one to Mercury 7 original astronaut John Glenn, who was present for today's ceremony honoring Armstrong. "I have been lucky enough to have a lot of opportunities in my life, so I'm not usually given over too much to envy of other people. That just is not part of my nature," remarked Glenn. "But for Neil, I make a big exception."